Aveiro is around 60km south of Porto along the coast and is famed for its salt flats, Venetian style canals and Ovos Moles – a soft coated, sweet egg which is very enjoyable and unexpectedly un-egg-like. The town is situated around 12km from the sea and is separated from the Atlantic Ocean by a network of lagoons which were made as a by-product of recovery work in 1808 when a canal was built to reconnect the harbour after it silted over in the 1500s. The lagoons were used as saltpans; rectangles cut into marshes where the salt is still accrued, refined and shipped on. Aveiro’s real beauty lies at the edges of the town where the canal network lends itself to a mini-Venetian experience as long, narrow boats ferry tourists about en masse, enjoying the colourful waterfront houses and shops as they go. A series of largely unspoilt beaches such as Praia de Barra have increased tourism and the town enjoys plenty of visitors each year as a result. A boat trip along the canals will cost you 5 euros and takes you on an hour long journey around the town’s waterways, taking in the spectacular waterfronts as you go. Exploration by bicycle is another popular activity and you can use bikes for free thanks to Loja BUGA. They need to see some ID before you take a bike. They are situated at the back of the Forum Aveiro shopping centre in a green kiosk. Mercado do Piexe (the fish market) can be found just behind Rua Joao Mendoca in a lovely square flanked by restaurants and cafés. Visit the Museum of Art Nouveau, on both Rua Dr B. De Magalhaes (main entrance) and the fish market square (rear). There is a lovely coffee shop at the back with bean bags, small tables and live music events, while upstairs there are displays of Art Nouveau at a cost of 1 euro per person. Take a bus to Costa Nova from Rua Joao Mendoca and enjoy several kilometres of beautiful golden sand beaches and lively Atlantic waves. You can also travel up to Praia de Barra which is more of a complete resort. Aveiro also has a couple of cinemas, sports grounds and shopping centres. There are a lot of restaurants around the fish market, a particular highlight being the café at the Museum of Art Nouveau where pastries and teas are the order of the day. Fish is really the order of the day at most places but there meat grills and the like dotted about town. Key restaurants include the upstairs at Mercado do Piexe, Neptuno on Rua Mendes Leita 1 where you can try Frango and other grilled meats; Salpoente at Cais de Sao Roque 83, considered the best fish restaurant in town. 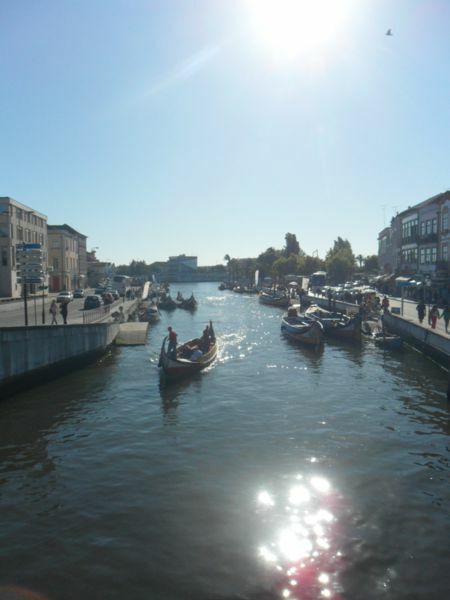 Aveiro is well stocked with hotels, hostels and pensions; being a university town it isn’t difficult to find accommodation. There is also a campsite at Praia da Barra, some 12km away. You can book a hotel by clicking here. 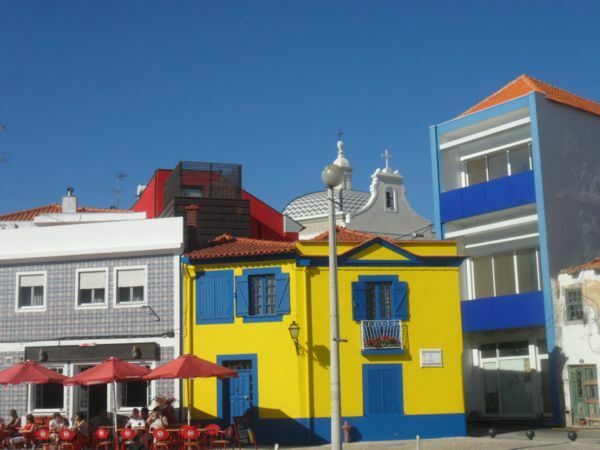 Aveiro is well connected by bus and train, the latter situated at the eastern end of Avenida Dr. Lourenca Peixinho (the main street). From here you can travel to Porto’s Sao Bento hourly and Coimbra B. Local buses run to Costa Nova and surrounding areas while express buses will take you to Lisbon, Porto, Coimbra and Delgado. Tickets for the expresses are available from Loja das Revistas or the news stand in Praca Humberto Delgado. Driving to Aveiro will require traversing the A17, an electronic toll road (read about those here). Negotiating the town is easy enough but parking can be a problem. There is a free car park by the sports ground (inder the IP5) off Rua B. Machado, otherwise you are limited to two hours at parking metres. Please leave comments or questions in the box below. This entry was posted in Aveiro, Major Cities and tagged Aveiro, general information, Portugal by david. Bookmark the permalink.